The Toronto Biennial of Art today announced three new appointments to guide its curatorial program. For the inaugural, city-wide art event taking place next fall from September through December 2019, and for the subsequent 2021 iteration, Candice Hopkins has been appointed Senior Curator and Tairone Bastien has assumed the position of Curator. As part of the Biennial’s core team, Ilana Shamoon has been hired as Director of Programming. Drawing on her extensive background as a curator working closely with both small, experimental art spaces and large-scale, recurrent exhibitions, Candice Hopkins will lead the curatorial direction of the Biennial including new art commissions, exhibitions, and publications. 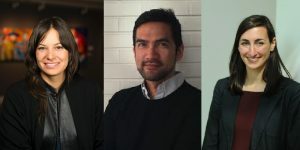 Hopkins is co-curator of the forthcoming SITElines 2018 biennial, Casa Tomada opening in August 2018, in Santa Fe, NM, and was recently named co-curator of the Canadian Pavilion at the 58th Venice Biennale featuring the media-work of Igloolik Isuma Productions Inc., opening in May 2019. She was a part Candice Hopkins Senior Curator Photo: Jason S. Ordaz Tairone Bastien Curator Ilana Shamoon, Director of Programming Page 2 of the curatorial team for documenta 14 in Athens, Greece and Kassel, Germany in 2017. She has published over 50 articles on contemporary art, sound, indigeneity, native economies, and vernacular architecture and is co-editor of two books. She has lectured widely at such venues as Artists Space, New York; Dak’Art Biennale, Dakar, Senegal; National Gallery of Canada, Ottawa; Tate Britain and Tate Modern, London; WIELS, Brussels, Belgium; and Witte de With Center for Contemporary Art, Rotterdam. Originally from Whitehorse, Yukon, Hopkins is a citizen of the Carcross/Tagish First Nation. Alongside Hopkins, Tairone Bastien will shape the Biennial’s curatorial vision. An independent curator and arts programmer working between Toronto and Dubai, Bastien is one of the curators for Nuit Blanche Toronto 2018. Bastien has held curatorial and programming positions for over a dozen years, most recently as Programming Director for Alserkal Avenue in Dubai. Bastien commissioned a series of iterative cross-border projects that have taken place as part of the Dhaka Arts Summit in Bangladesh and Shubbak Festival in London. He was also a curator for Performa, developing performances, online radio broadcasts, and site-specific installations for Performa 05, Performa 07, and Performa 09. As a permanent staff member of the Biennial, Ilana Shamoon will lead all aspects of the Biennial’s overall programming and partnership initiatives. She was curator at the Fondation Cartier pour l’Art Contemporain in Paris (2006‒15) where she curated/ co-curated numerous exhibitions including Native Land, Stop Eject, and regularly commissioned related artworks, events, and performances, the most recent being the acclaimed 2015 pop-up radio show the Pan African Space Station. Shamoon ran the public art program at Waterfront Toronto from 2016‒17 and has worked as an independent curator for institutions including Ryerson Image Centre, Toronto. She joined the Biennial Curatorial Advisory Group in 2016 and subsequently led the Curatorial Framework research and brief for the inaugural curatorial team. The city’s waterfront—a rapidly changing, symbolically rich, historically charged, and connected shoreline—will be activated by over 40 artists from various disciplines, along with writers, activists, community organizers, and other participants. Artworks, including significant site-specific commissions in new and unexpected venues for art, will be curated to enable exploration of the complex history of the region. Partnership programming with innovative art spaces, established art institutions, artist-run centers, community organizations, and educational institutions will be an integral piece of the Biennial’s core activities. Wherever possible, access to the Biennial will be free for visitors of all ages. More details will be announced later this year. An organization with an ongoing presence between biennial events, the Biennial is developing and presenting a host of public programs with partners in Toronto beginning in spring 2018.